KLM is the Netherlands' flag carrier operating flights from Johannesburg and Cape Town (seasonally) to Amsterdam's Schiphol Airport and beyond. 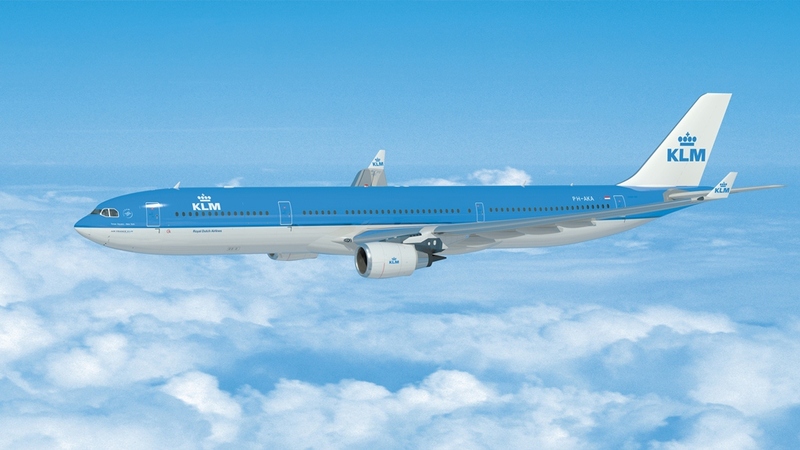 KLM Royal Dutch Airlines offers 4 flights a week from Cape Town and daily flights from Johannesburg to Amsterdam. Skytrax rates KLM a 4 star airline and says it has the best airline staff service in Europe. KLM is a subsidiary of the Air France-KLM Group and has been operational since 1919. They currently operate flights to an approximately 130 destinations around the world! Interested in earning a unique SouthAfrica.TO travel voucher? Then you should read all about our programme where we give discount vouchers for flight reviews. 26 October 2018. The airline announced that Economy class passengers booking flights from the 30th of October 2018 onwards will only be allowed one checked bag weighing 23kg. Passengers who booked before the 30th of October 2018 will still be allowed two checked bags. These changes do not affect premium economy and business class passengers. 20 November 2015. KLM Air France has announced that they will expand their seasonal Cape Town - Amsterdam service to become a year-round service. From May 2016 they will be operating the route with their new Boeing 787-9 Dreamliner. The route has reportedly been 92,2% full due to South Africa being a popular tourist destination year-round. “Cape Town is a very popular tourism destination for Dutch travellers and this group makes up the third largest group of visitors from Europe after tourists from the UK and Germany,” says Tim Harris, ceo of Wesgro. 21 July 2015. Consider yourself a tech junkie? Then you might like to know that KLM has become one of the first airlines to launch an app for the Apple Watch. Travellers can download the latest mobile app, which also supports the Apple watch platform, to ease the check-in process as well as to stay up to date with flight schedules and times. Flying Blue members can also use the watch for up to date information on their status and miles. “Including the Apple Watch app in our range of digital services ties in perfectly with KLM’s ambition of providing its customers with the right service, at the right place, at the right time. The personal nature of the Apple Watch offers lots of potential to expand this commitment in the future,” says Tjalling Smit, senior vp digital Air France KLM. KLM wins once again! 31 Jul 2014. KLM saved the day, at least for Freshly Ground and their fans! The airline came to the group's rescue after they expressed concern on Facebook over whether they will be able to make it to Glasgow for their Commonwealth concerts. Their flight from Amsterdam to the UK was delayed due to bad weather, leaving them stuck in Schiphol Airport. KLM immediately responded with great humour, even requesting an impromtu airport performance from the group whilst finding suitable flights for them. Thanks to KLM, fans of the group haven't been disappointed and could see them live in the UK yesterday! 15 Jan 2014. eDigitalResearch announced that KLM topped the Travel Social Media Benchmark with over 4,5 million followers on Facebook. This is significantly more than any other airline. They are also communicating with more fans on other social media sites like Twitter, Pinterest and Google+ than any other party in the travel sector. 14 Sep 2013. KLM flight 592 from Johannebusrg to Amsterdam has an engine shut down just south of Rome, after a possible oil leak was noticed. 22 Jul 2013. KLM wins the Airline Strategy Award for Environmental friendliness, after becoming the first airline to fly a passenger flight partially powered by biofuel. 25 Mar 2013. KLM shows off its new business class seats on its Boeing 747-400s, with greater privacy, curtains & new carpets. “By choosing to work with Hella Jongerius, KLM is opting to engage a top Dutch designer to help make our business-class passengers feel at home on board. As a designer, Hella has broad experience that she can apply to the needs of KLM and its customers, in accordance with the specific requirements for cabin interiors in the airline industry. Her previous projects demonstrate her ability to process such criteria into top-quality designs such as the ‘polder sofa’, which is both comfortable and beautiful. With her expertise and focus on quality, she is keenly aware of what makes a brand unique.” said the Managing Director KLM, Erik Varwijk. The first flight with the newly designed seats will be in July 2013, and all B747s will be completely refitted by April 2014. The next step is to start work on the Boeing 777's in 2014. 1 May 2013. Amsterdam - Cape Town flights are reduced from 5 to 4 a week. 28 Mar 2010. A new KLM baggage allowance regime is introduced. Dec 2009. KLM Economy Comfort seats are introduced (in between economy and business class). 27 Oct 2003. The first non-stop flight from Amsterdam to Cape Town. 7 Oct 1947. A scheduled service from Amsterdam to Nairobi to Johannesburg commences. 26 Mar 1947. Test flights commence from Amsterdam to Tunis, Tripoli, Kano & onward to Johannesburg. 6 Oct 1946. The first KLM flight to Johannesburg is made by Captain KD Parmentier in a DC-4 PH-TCE. KLM is the Leader in Social Media intergration. Check out this video which shows how they reward passangers who tag, mention or tweet to them while waiting for their KLM flights to depart. Chip Walter flew from Amsterdam to Africa with KLM: "THAT is the end game – Africa. Flights to an exotic place, a place of Good Hope, a place that the great Dutch explorers settled and swept around as they plied the world’s waters and created the first global trade routes. AND a place I would soon write about where the world we live in today began a very long time ago. That was where I was headed, and I’m sure my journey wasn’t nearly as difficult or as dangerous as even the richest Dutch captain. So I have resolved to shut my yap, open my sleepy eyes and smile at all the other Last Apes Standing, each with their own issues and dreams and destinations, flowing around me in search of plumbing and caffeine." Rating 4.5/5 : Whilst growing up in Mbabane, an incident at an airshow results in Coy Dlamini being afraid of flying. 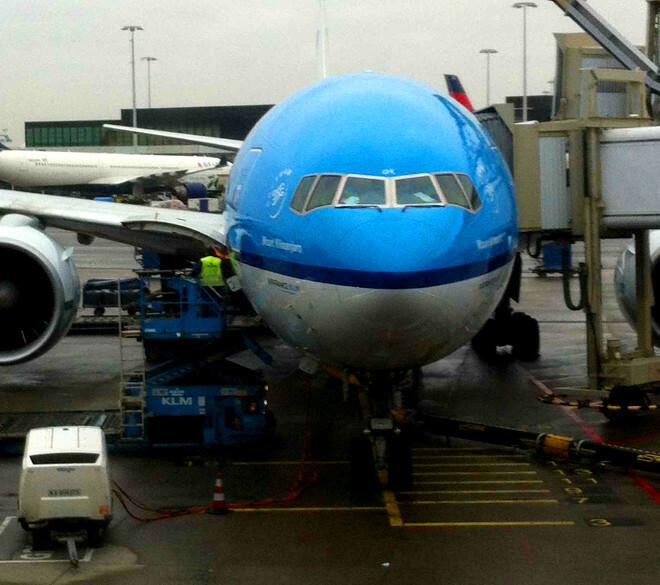 In this delightful review, Coy explains how KLM cured his fear of flying. KLM operates flights to the following destinations in the UK: Aberdeen, Birmingham, Bristol, Cardiff, Durham, Edinburgh, Glasgow, Humberside, Kent, Leeds, London, Manchester, Newcastle & Norwich. 27 October 2013. KLM commences 12 flights a week to Florence in Italy. KLM's Baggage Services are handled by BidAir, who you can phone at 011 921 6074/73. - Golf Bags are counted as part of the free baggage allowance. Like any other baggage item, normal dimensions and weight apply. The voucher can be pre-printed at "www.flyingbluegolf.com"